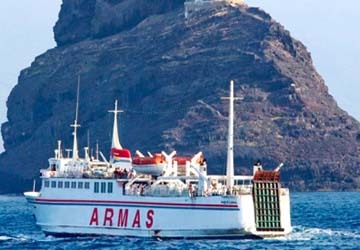 The Morro Jable Las Palmas ferry route connects Fuerteventura with Gran Canaria and is currently operated by 2 ferry companies. The Naviera Armas service runs up to 8 times per week with a sailing duration of around 2 hours 50 minutes while the Fred Olsen Express service runs up to 3 times per day with a duration from 2 hr. So that’s a combined 29 sailings on offer per week on the Morro Jable Las Palmas route between Fuerteventura and Gran Canaria. Compare now and get the best fare at the time that you want to travel. Prices shown represent the average one way price paid by our customers. The most common booking on the Morro Jable Las Palmas route is a car and 2 passengers. The ferry was on time and comfortable. However, the Wi-Fi service wasn't available. 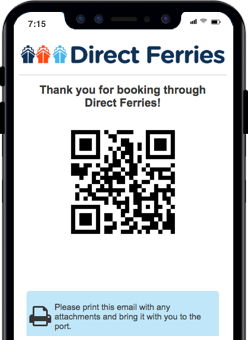 I took the ferry 6 times in 15 days and on all occasions I couldn't use this service. I asked explanations, but nobody seem to be able to explain why this service was unavailable. The seats cover are old, dirty and stained; they should be cleaned. The trip itself was ok, fast and on time even though it was expensive. Cozy and comfortable crossing guaranteed. "Crossing Morro Jable / Fuerteventura - Las Palmas de Gran Canaria "
Very good service at check-in: we were once again after the departure time call after the day before, but were able to check the same already and needed only later be for boarding on site. When we arrived, we were more or less immediately passed as the first on the ship because we had a "Golden Ticket". Then the actual embarkation was only going maybe coincidence we found it great. The service on board was good, in the gold-class drinks and snacks were included. Located at the southern end of the island of Fuerteventura, one of the Canary Islands, is the village and port of Morro Jable. Located on both sides of the headland are the older parts of Morro Jable, around which the village was built. The village's port, which is now part of the tourist offerings the village has, was originally home of the village's fishing fleet, and continues to be so. Today, from the port visitors can hire boats to go fishing and there is also a ferry service to Gran Canaria. The part of the old village that is separated from the port by the headland runs up a barranco, or valley, into the hills. The newer parts of the town have been built to connect the old village area and the port area, and the tourist facilities have been built along the coast to the east of the old village, in such a way that Morro Jable now stretches for a mile or so along the coast, the newer parts having been appended to the older parts in a pleasant way. 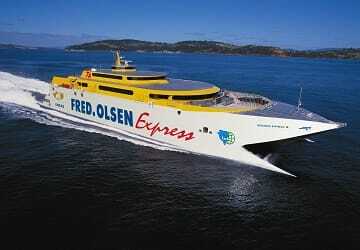 Ferries from Morro Jable generally depart to Las Palmas, Santa Cruz de Tenerife and Puerto del Rosario. The Spanish city of Las Palmas de Gran Canaria is the capital of the island of Gran Canaria, in the Canary Islands. The city lies in the north eastern part of the island and sits across two bays and a number of lovely beaches. The city was founded in 1478 and has an important cultural and historical heritage which seems to be centred in the district of Vegueta which is the oldest part of the city and was declared a UNESCO World Heritage Site in 1990. The city is also home to one of the most important ports, Puerto de la Luz, in Europe which helps to give the city a lovely cosmopolitan feel. There are many things to see and do in the city but a short distance away from the city's centre visitors will find lovely beaches and crystal clear waters. 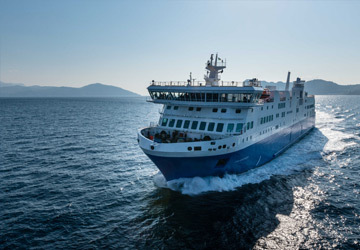 From the city's port ferry services provide connections to several islands (Fuerteventura, Lanzarote, La Palma, Tenerife) and also the south of Spain (Huelva and Cadiz).